London Stansted's £600m Transformation program will be the biggest upgrade to the airport in nearly 30 years. Ramboll's role in the Pascal+Watson led multidisciplinary design team, builds on our 20 year partnership with the UK's fastest growing airport. The expanded terminal complex will respect the design of the original building and provide new facilities throughout. When completed, the airport will consolidate its position as London's third airport and provide a new, improved experience for travellers to and from the UK. London Stansted's terminal building opened in 1991 with the intention of establishing the airport as London's third airport. Since MAG acquired London Stansted in 2013, it has been one of the UK's fastest growing airports with passenger numbers increasing from 17 million a year to over 28 million today. Stansted Airport has permission to serve up to 35 million passengers per annum (MPPA, The airport is forecast to deliver up to 50 percent of London's expected passenger growth over the next decade, and has recently received approval from Uttlesford District Council's planning committee to allow it to serve up to 43 MPPA. Ramboll has worked with Stansted Airport for over 20 years designing airside and landside infrastructure and buildings. We were involved in early studies for the second terminal building at the airport and are currently providing multi-disciplinary engineering design services in support of the Stansted Transformation Project expanding the airfield, the car parks and the terminal buildings. Following our appointment to work with lead architect Pascall+Watson on phases 2 and 3 of the Stansted Transformation Project, Ramboll secured further work at the airport in 2019. In addition to the tender design for the Arrivals building that was delivered in summer 2018 and our continuing work designing the reconfiguration of the existing terminal to provide expanded departures facilities, Ramboll's recent instruction includes the design of a new Coaching Building. Scott Edgar, Buildings Director at Ramboll commented: "The Stansted Transformation Programme scope of works has provided a fantastic opportunity to improve the performance of the existing assets in terms of passenger experience, commercial revenue, energy use and resilience, whilst also delivering innovative solutions in the design of the new infrastructure. It is rare that you get the chance to work on a scheme that involves so many of the functions of an operational airport and it's incredibly exciting to be involved in the delivery of a scheme that will position Stansted for the next 20 years." Designs for the planned transformation will meet the demands for short-term growth and set the framework for achieving long-term growth. Once completed, the transformed terminal complex will reinstate the coherent, spacious feeling of the original building and provide additional footprint for passenger facilities as a departures-only facility. Updated technologies and more flexible facilities will be provided to meet the needs of such diverse growth. This includes a new Arrivals Terminal with dedicated immigration and reclaim facilities; the existing terminal reconfigured to a 'shoreline' check-in arrangement including extensive use of self-check-in and self-bag-drop technology; expanded and enhanced aviation security and redesigned passenger waiting; and an improved commercial and food and beverage offer. The satellites and passenger connections to airside will also be progressively upgraded to connect all parts of the terminal complex. A new landscaped Arrivals plaza will be created adjacent to the existing forecourt which will become a new focal point for travellers arriving in the UK. Achieving this transformation within and around the boundaries of an existing operational terminal will be extremely challenging. The design team has worked with Stansted Airport to develop a number of strategies to provide the maximum benefit while minimizing disruption to passengers and airline operations. Key to this is the delivery of the new Arrivals Terminal as quickly and cleanly as possible. The capacity provided by this new building allows further development to take place within the existing terminal, away from passenger operations, which maximized safety and minimizes disruption. New departures facilities can then be provided inside the existing terminal in a progressive and predictable fashion. The new Arrivals Terminal will be constructed first and will sit adjacent to the existing terminal which will remain open throughout the construction period. This will include greater meet and greet space, new immigration facilities and improved access for onward travel. On completion the current terminal will be recommissioned as a dedicated departures terminal, with more space and a 'shoreline' check-in layout, which will provide more passengers with a smoother more intuitive check-in process. Speed of delivery will be maximized due to the relatively unencumbered nature of the site and interfaces can be carefully managed. The construction method of the new building will be optimized for flexibility allowing a number of possible operational configurations within the same, regular footprint, providing long-term operational resilience and future opportunities to amend the layout to meet demand. It will be as efficient as possible in construction and operation as well as an environmentally friendly airport building. The concept of a standalone Arrivals Terminal will also allow the design team to maximise the environmental benefit of the new facility as opposed to extending the existing terminal. Engineering design has been driven by improving the passenger experience and energy efficiency. 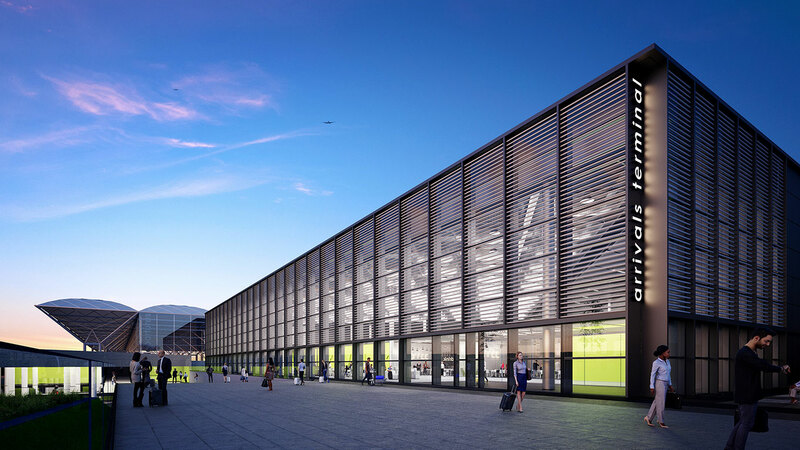 Passive measures will be used to reduce the overall energy demand of the Arrivals Terminal, including the use of high-performance glazing and brise soleil to maximise natural daylight across the public areas while reducing solar gains. This also reduces the reliance on artificial lighting and gives passengers a more pleasant experience as they pass through the terminal. For the ventilation systems, free cooling and heat recovery will be used throughout the new building to reduce the reliance on mechanical cooling. In addition, a new energy efficient centralised MEP plant will be provided for the Arrivals Terminal which will be easily expandable in the future to enable the replacement of the ageing plant serving existing buildings. The Arrivals Terminal will achieve a BREEAM rating of Very Good as a minimum. This philosophy has been considered in all areas including the structural design of the baggage reclaim area which has been designed to provide passengers with an unobstructed transition through the Arrivals Terminal. We are delivering an innovative design that minimises the impact on the operation of the airport on what is a highly constrained airside site. The new Coaching Building will deliver an additional nine coaching gates with skylinks, providing connectivity to the existing Satellite piers 2 and 3 and represents another important step in the expansion of the airport's capacity to 43 MPPA.